As reported on CTV News, after a long and contentious fight, there’s a new twist in a proposed development for Dartmouth. 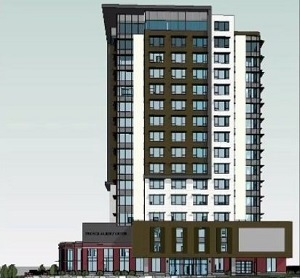 Instead of putting an eight-storey apartment building near Lake Banook, the developer, MCO Investments Ltd., now intends to build a 16-storey hotel. Last fall, Halifax regional council approved the plan for an apartment at a site on Prince Albert Road. The developer’s change of plans is upsetting to the local councillor. “Somewhere along the way, he’s changed his mind and now that’s what he wants to build here, which is, really, a slap in the face, it really is,” said Halifax Regional Coun. Sam Austin. Development of the site has been controversial for years. Austin says because of outdated commercial zoning laws, the hotel development doesn’t require council approval. Tim Rissescoof the Downtown Dartmouth Business Commission says the city needs to move forward with the Centre Plan so that it can foster the type of development it wants in the urban core, downtown Dartmouth, inside the Circumferential Highway in Dartmouth, and on the peninsula in Halifax. “This is a little bit of a relic of the past, that you’d be able to build a 16-storey commercial building there,” Rissesco said. Nearby residents have concerns about the project and how a 16-storey building could impact paddlers who use Lake Banook.